The Scolopaci include the Jacanidae (jacanas), Rostratulidae (painted snipes), Pedionomidae (plains wanderer), Thinocoridae (seed snipes), and Scolopacidae (sandpipers, snipes, and allies). Among others, these birds share the presumably derived absence of a foramen for the supracoracoideus nerve on the coracoid. Olson (1999a) described remains of putative Scolopaci from the early Eocene of the Nanjemoy Formation of Virginia. Owing to the fragmentary nature of these specimens (incomplete humerus and distal tarsometatarsus), their identification needs further substantiation. Paractitis bardi Weigel, 1963 from the late Eocene (Chadronian) of Canada is based on the omal extremity of a coracoid, which was assigned to the Scolopacidae because of the absence of a foramen for the suprac-oracoideus nerve. As noted above, this feature is characteristic for all representatives of the Scolopaci. 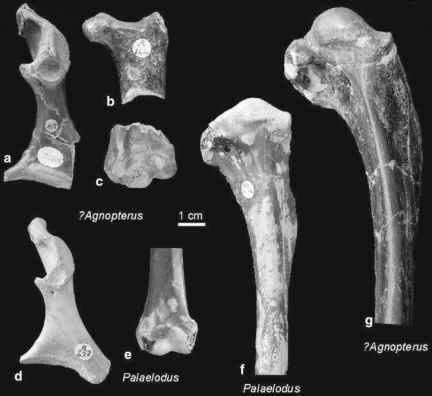 A well-preserved postcranial skeleton of an unnamed species of the Scolopacidae from the early Oligocene of the Luberon area in France was described by Roux (2002). Apart from the proportionally longer tarsometatarsus, this specimen was about the size of the Eurasian Woodcock (Scolopax rusticola). The humerus bears a well-developed dorsal supracondylar process, and a short hallux is present. Assignment of this specimen to the Scolopacidae was mainly based on the shape of the acrocoracoid process of the coracoid. Although this classification would be in line with the overall morphology of the fossil, it has not yet been established with derived characters. A fragmentary coracoid of a representative of the Scolopaci was also reported from the early Oligocene of Belgium (Mayr and Smith 2001). "Totanus" edwardsi Gaillard, 1908 from an unknown horizon of the Quercy fissure fillings awaits restudy and an assessment of its affinities within the Scolopaci. A tentative record of the Phalaropodinae (phalaropes), consisting of the omal extremity of a coracoid, comes from the late Oligocene of France (Mourer-Chauvire et al. 2004). The Jacanidae today occur in the tropic regions of all continents and are assumed to be the sister taxon of the Rostratulidae (Paton and Baker 2006; Fain and Houde 2007). These quite aberrant Charadriiformes have the proportionally longest toes of all modern birds, which enable them to walk on floating vegetation. The only Paleogene fossil records are three species from the late Eocene and early Oligocene of the Jebel Qatrani Formation in Egypt. All are known from distal tarsometatarsi only and were described by Rasmussen et al. (1987) as Nupharanassa bulotorum, N. tolutaria, and Janipes nymphaeobates. A derived feature shared with extant Jacanidae is the large distal vascular foramen, which opens dorsally in a very wide fossa. The early Oligocene N. bulotorum and J. nymphaeobates are distinctly larger than extant Jacanidae, whereas the late Eocene N. tolutaria falls within the size range of the modern species (the latter species was also considered to be of early Oligocene age in the original description, but see Rasmussen et al. 2001).